1. 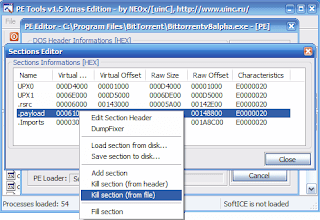 Unpack UPX packed bittorrent.exe for example with FUU which can be downloaded here. 2. Open the unpacked bittorrent.exe in a Hexeditor for example HxD. Remove Section Payload (~380 kb) using for example PE Tools and Rebuild the exe file.